Growing up in the suburbs of Detroit, Julie Cislo always had a burning desire to help underprivileged people. After earning a B.S. in environmental conservation at Northern Michigan University in 2007, she worked for General Motors but found time to volunteer at an adult literacy center. Cislo couldn’t shake the notion of doing more for people in poverty so she joined the Peace Corps. Julie Cislo celebrates the local holiday of San Isidro with students in Panama. She served in a site in the province of Coclé four hours away from Panama City, teaching English to elementary school children from January 2012 to February 2014. Outside the classroom, Cislo started a recycling program, helped manage a seed bank and trained Peace Corps volunteers in the principles of organic gardening. Cislo was the dedicated “Seeder” for her province, preserving and distributing seeds to volunteers and people in the community. 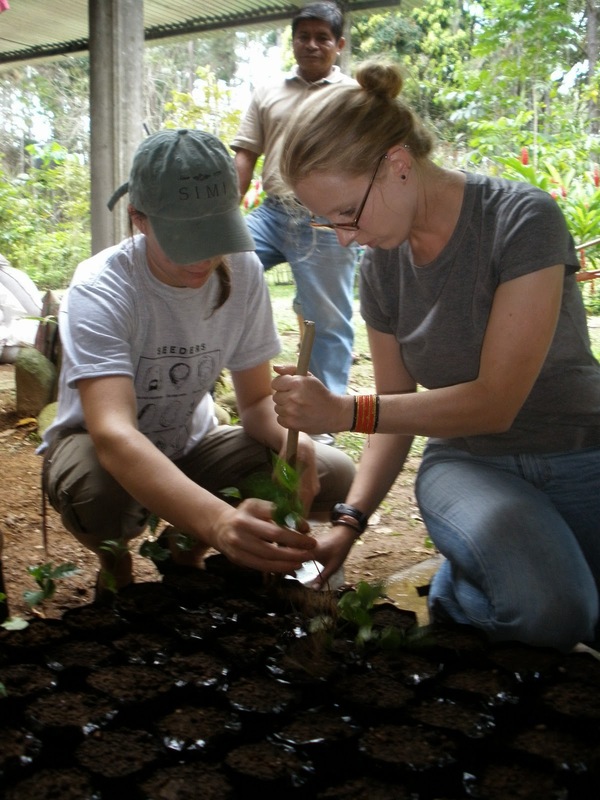 Julie Cislo, right, works with a Peace Corps volunteer to prepare plants to be sold at a community nursery. The Peace Corps taught her to work with limited resources. She also learned the value of working with others. “If I didn’t have a pot or food I could ask my neighbors,” she said. Cislo’s career goal is to work for the Natural Resources Conservation Service and to some day volunteer for the Peace Corps a second time. In her spare time, she enjoys reading, crossword and jigsaw puzzles, camping, hiking and hanging out with her cat. Julie Cislo celebrates a student's birthday under their "rancho." Professor David Valentine and Associate Professor Susan Todd welcome Julie Cislo to the School of Natural Resources at UAF.